Hiya guys! I know this week I have been a little bit MIA, but I have not been feeling too well. I'm getting frequent sugar drops and have been on bed-rest straight from work. Definitely want to take the time to thank the lovely brands I work with for being so patient with me as I get myself back on track. Now for today I'm sharing swatches for the entire Wizards Collection by Ellison's Organics, which is inspired by Harry Potter. This is a huge collection consisting of ten shades in a variety of colors and finishes. Needless to say, this is going to be an extremely photo-heavy post! Potter-heads unite and let's get to the swatches. 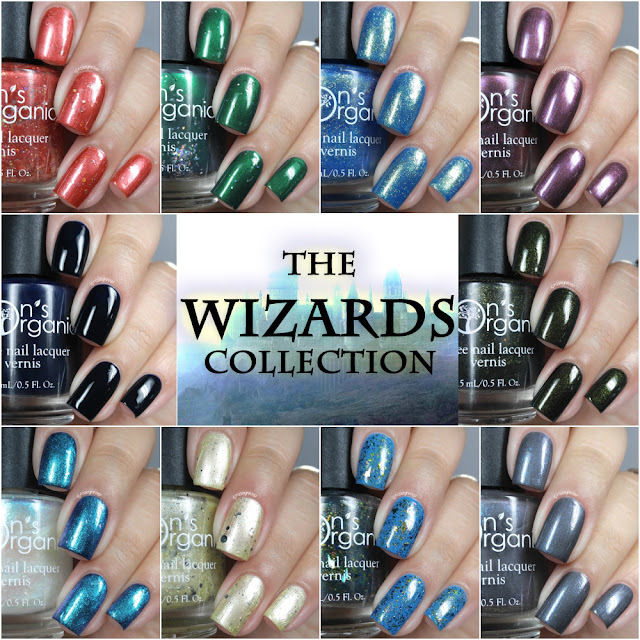 The Wizards Collection by Ellison's Organics is now available for purchase. Each full-size (15 mL) bottle retails for $12.00. Also note there is free shipping on all orders of $20.00 and above! Brave can be described as a bold red nail polish with a variety of sizes of gold and holographic glitter. Brave is named for the people in our lives who exhibit courage, chivalry, and determination. The formula has a great consistency for layering with nice glitter distribution per stroke. The base is very shimmery so you will notice some visible brush strokes on the finish. I also feel like the glitters contrasting against the shimmer gives this polish an almost textured look. However that's definitely not the case as this dries down to a smooth finish. Shown here in two coats and sealed with a glossy topcoat. 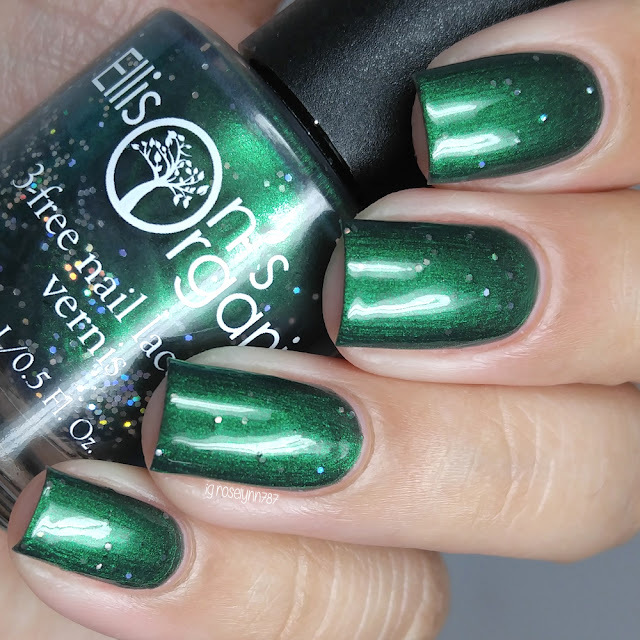 Cunning can be described as a dark green polish with green and black shimmer and silver holo circle glitter. Inspired and named for ambitious, resourceful, cunning friends, family and coworkers. One of my favorites in this collection, this tone of green looks so rich and sparkly. The formula has a really smooth and opaque application. The silver glitters end up feeling scarce, but I actually preferred it that way. The minimal brush strokes in this one work much better against the shimmer and actually serve to give more depth to the shade. Shown here in two coats and sealed with a glossy topcoat. Emotional Range of a Teaspoon can be described as a plum purple shimmer polish with hints of lavender, light purple and darker purple. Inspired and created in sympathy with younger sisters who can't believe their older brothers just don't get it. Like the previous two, the formula and application are easy to work with. There are some minimal brush strokes in the finish, but for the most part they do end up blending out after topcoat. Shown here in two coats and sealed with a glossy topcoat. I'm Extremely Famous can be described as a beautiful deep navy crelly. Another favorite of mine, this shade is everything I love in a polish. Creamy, luscious, opaque, and full of vamp! The formula had a perfect consistency, not too thick or too thin. Almost a one coater with how opaque the application is, but it does definitely need at least a thin second for a full finish. Also despite its heavy pigmentation, I experienced no staining to my nail beds or cuticles. Shown here in two coats and sealed with a glossy topcoat. LeviOsa, Not LevioSA can be described as a gorgeous color shifting shimmer topper. Words cannot express how much I adore the combination of LeviOsa, Not LevioSA and I'm Extremely Famous. Don't get me wrong, I've had tons of shimmer toppers in the past (as I'm sure we've all had). With this one in particular I feel like the shimmer is much more tightly packed together, which ends up creating such a gorgeous full-coverage effect. Shown here in two coats over I'm Extremely Famous and sealed with a glossy topcoat. Turn on the Light can be described as a dark shimmering polish that shifts from purple to blue. The formula was a bit on the thicker side but completely manageable and still easy to work with. The consistency was also extremely opaque and felt like it barely needed the second coat. Shown here in two coats and sealed with a glossy topcoat. Loyal can be described as a shimmery gentle yellow with black and holo glitter. This one is probably my least favorite in the collection simply because I don't feel it compliments my skin tone very well. That aside, I can't help but think this is such a unique combination. I think it would look absoutely stunning on a fair complexion! The formula is a bit on the sheer side, but has a nice smooth buildup. The brush strokes are still visible after drying and topcoat. There is also some fishing needed for the larger round glitters. Shown in three coats and a glossy topcoat. Up to No Good can be described as a dark, almost black base with deep green undertones and a green and gold shimmer. Shown here in two coats and sealed with a glossy topcoat. 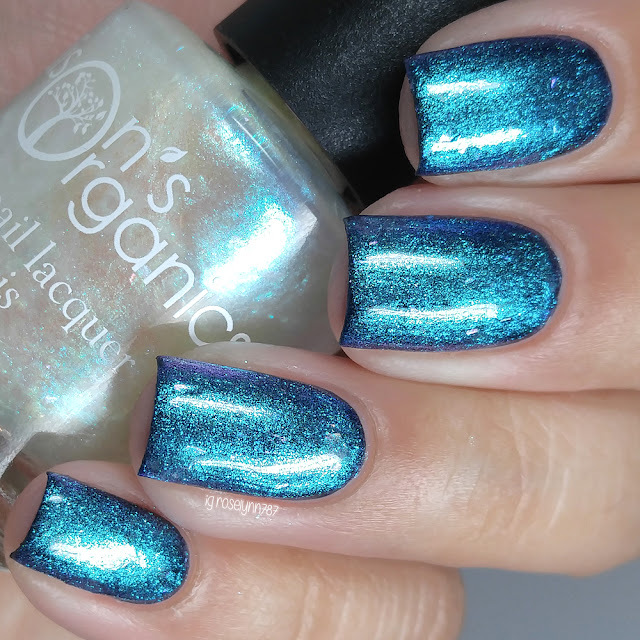 Wise can be described as a shimmering blue with holographic micro-glitter. Inspired and named for friends, family and coworkers who exhibit intelligence, knowledge, and wit. Another favorite of mine, this one is definitely another must-have. I feel like my photos are slightly blurry for this one, but it was so difficult to capture due to how sparkly the finish it. My camera seriously was having a melt down over it, haha. Formula is a little bit sheer, so it will need some layering to cover up the nail line. It dries to a slightly gritty finish, but smooths out perfectly with one layer of topcoat. Shown here in three coats and sealed with a glossy topcoat. Yer a Wizard can be described as a multi-flakie topper with golden lightning bolt glitters. Such a fun topper, I was not expecting to like this one as much as I do. It really goes so nicely with any base color, I believe I ended up trying it over black and a teal as well. The formula has a really nice consistency with ample flakies per brush stroke. The lighting bolts do need both a bit of fishing and placement. But due to them being on the larger side, I actually prefer it that way so as to not over clump the nail. Shown here over a blue base with two coats and sealed with a glossy topcoat. Overall this is such a gorgeous and diverse collection with something for everyone to fall in love with. I have to give this collection a huge Hufflepuff seal of approval! Tell me guys, which one of these is your favorite? Or are you like me and just love the whole collection? To recap, the Wizards Collection by Ellison's Organics is now available for purchase. Each full-size (15 mL) bottle retails for $12.00. Don't forget to take advantage of free shipping by purchasing $20.00 or more. There are a few that I have jotted down on my wishlist but I'm Extremely Famous is my absolute favourite!